2063, CENTER CAP USED, 95-00, CHRY, SEBRING, GRAY PLASTIC RUFF FINISH PUSH IN STYLE NO WIRE CLIPS. 2-1/4" DIA. FOR A 16", PAINTED SILVER WITH POLISHED LIP, ALSO COME WITH OUT POLISHED RIM. 5 SLOT. 2257, CENTER CAP USED, 19", 05-08, CHRYSLER, PACIFICA, CHROME PLASTIC CAP, SILVER LOGO, 5 SETS OF PLASTIC CLIPS, WIRE RING, 6-7/8" DIA. 2323, CENTER CAP USED, 07-09, DODGE, ASPEN, CHROME PLASTIC CAP, 7 RAISES TO MATCH SPOKES, CHROME AND GREY LOGO, 5 PLASTIC CLIPS, WIRE RING, 7-1/8" DIA. 3054b, CENTER CAP COPY, 93-96, MERCURY, GRAND MARQUIS, CHROME PLASTIC CAP, BLACK CENTER, 5 PLASTIC CLIPS, WIRE, 6-1/4" DIA. 3054b, CENTER CAP COPY, 93-96, MERC, Grand Marquis, CHROME PLASTIC CAP, BLACK CENTER, 5 PLASTIC CLIPS, WIRE, 6-1/4" DIA. FOR 15" ALUM LACY SPOKE DESIGN. 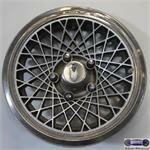 3081a, Hubcap used, 15", 77, CHEVY, MONTE CARLO, WIRE TYPE, PLASTIC. 3081c, Hubcap used, 15", 77, CHEVY, CHEVELLE, CHROME OUT RING, PLASTIC WIRE TYPE, SILVER PAINTED, KNIGHT HEAD LOGO, METAL CLIPS. 3147, HUBCAP USED, 13", 82-84, CHEVY, CELEBRITY, CHROME OUTER RING, PLASTIC. 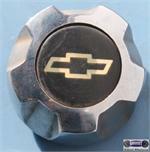 SPARKLE SILVER CENTER WIRE TYPE, FAKE CHROME LUG NUTS, RAISED CENTER WITH SILVER & GOLD LOGO, METAL CLIPS. 3327,12mm CENTER CAP USED, 16", 99-00, FORD, EXPEDITION, CHROME PLASTIC CAP, 5 INDENTS ON OUTER EDGE, ETCHED LOGO, 5 METAL CLIPS, 7-3/8" DIA. 3327,12mm CENTER CAP USED, 16", 99-00, FORD, EXPEDITION, CHROME PLASTIC CAP, 5 INDENTS ON OUTER EDGE, ETCHED LOGO, 5 METAL CLIPS, 7-3/8" DIA. FOR 14mm ORDER UNDER 3395 CC. 3367a-2, CENTER CAP USED, 00-11, FORD, FOCUS, SPARKLE SILVER PLASTIC CAP, BLUE FORD OVAL, 8 PLASTIC CLIPS, HAS GROOVE FOR WIRE RING, 2-5/8" DIA. 3450b, CENTER CAP USED, 02-05, FORD, EXPLORE, CHROME PLASTIC CAP, 5 INDENTS ON OUTER EDGE, BLUE FORD OVAL, 5 PLASTIC CLIPS, 5-3/4" DIA. 3470, CENTER CAP USED, 02-03, FORD, THUNDERBIRD, CHROME PLASTIC CAP, RAISED LIP, SILVER BIRD LOGO, 5 PLASTIC CLIPS, ALIGNMENT PIN, 6-1/2" DIA. 3470, CENTER CAP USED, 02-03, FORD, THUNDERBIRD, CHROME PLASTIC CAP, RAISED LIP, SILVER BIRD LOGO, 5 PLASTIC CLIPS, ALIGNMENT PIN, 6-1/2" DIA. ALSO FITS 3469A CC. 3603f, FRONT CENTER CAP USED, 05-07, FORD, F-250SD, F-350SD, CHROME PLASTIC CAP, 8 FAKE LUG NUT CAPS, OPEN CENTER, 4 METAL CLIPS, 8-1/4" DIA. 3623b, CENTER CAP USED, 06-08, MERCURY, GRAND MARQUIS, CHROME PLASTIC CAP, DARK GREY BACKGROUND, ETCHED MERCURY, 2 ETCHED DOTS, 6-1/2" DIA. 3623b, CENTER CAP USED, 06-08, MERCURY, GRAND MARQUIS, CHROME PLASTIC CAP, DARK GREY BACKGROUND, ETCHED WORD MERCURY, 2 ETCHED DOTS, 5 PLASTIC CLIPS, WIRE RING, 6-1/2" DIA. FOR A 16", RIM. 5047b, CENTER CAP USED, 96-02, GMC, SAFARI, CHROMED PLASTIC, 5 LUG NUT HOLES, BLACK CENTER, RED GMC LOGO, OUTLINED IN CHROME, 7-1/4" DIA.